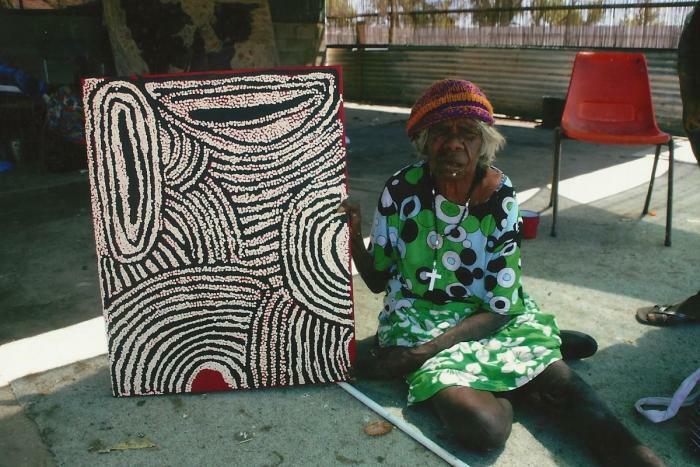 Nancy Ross Nungurrayi was born in the desert at Karrku, a large hill about 800 kilometers west of Alice Springs. Nancy was the sister of Naata Nungurrayi and George Tjungurrayi, both well known artists. Until her death, Nancy and her family lived in Kintore. Nancy painted complex series of patterns that depict the holy places from the "Dream Time" (Tjukurrpa) around her traditional homeland. The concentric circles refer to specific locations that are used for ceremonies. The parallel lines that connect these circles are ancestral paths called "song lines" created by the mythical ancestors (Tingari) of the Aborigines. One of the main sites, often painted by her sister Naata as well, is the rockhole site of "Marrapinti." Here, the women of the "Dream Time" gathered for various ceremonies during the creation of the earth. They were looking for a local kind of tomato called kumparapara, which they grinded into a paste and baked with hot coals. In Nancy’s work, the women are represented by a "U" shape and the background colours and patterns represent different aspects of the landscape, like sand dunes and rocky outcrops called tali and puli respectively.